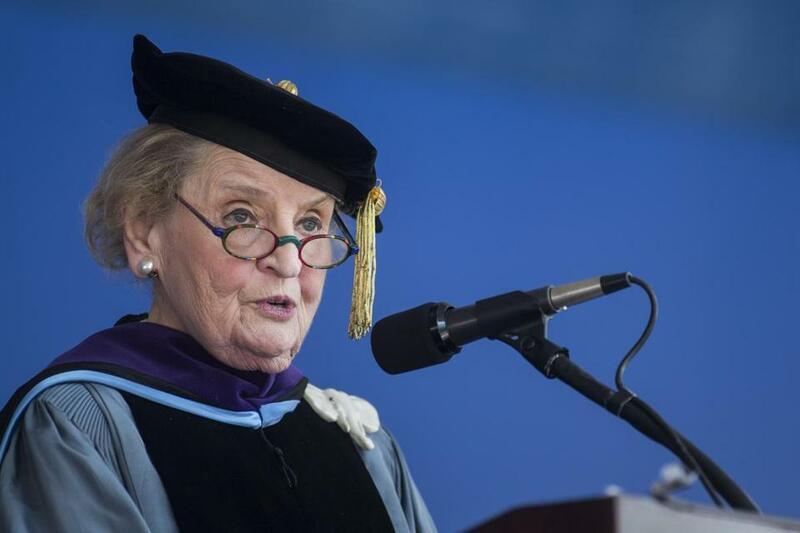 Former Secretary of State Madeleine Albright spoke at Tufts University’s commencement on Sunday. Madeleine Albright praised the Tufts community as a “light on the hill” for its activism work as students carried out a quiet protest during this morning’s commencement ceremony opposing a Tufts plan to cut janitor jobs. “You have stood up on behalf of workers, you have spoken out against the scourge of sexual assault, you have made clear that black lives matter, and you have pressed for action on climate change,” Albright said. Dozens of graduates held red signs during the commencement ceremony, with the words “I support Tufts janitors” on a heart shape. Some graduates pinned what appeared to be a single piece of white fabric, in solidarity with the custodial staff. According to a student organizer, faculty members, parents, alumni, underclassmen and other guests also held signs in support, and a number of faculty members wore the squares. 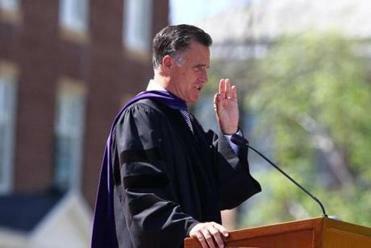 The former presidential candidate said the country needed a new generation to shape its political discourse. The university conferred 3,406 degrees: 1,992 graduate degrees and 1,414 undergraduate degrees at the commencement ceremony at the school’s Medford and Somerville campus. Amid the pomp and circumstance, some students decorated their caps; some had forward-looking phrases like “Allons-y” — “Let’s go” in French — while others had playful and silly things, like “Pizza” accompanied by a hand-drawn slice. Albright touched upon a number of major themes during her speech, including racial discrimination, the widening gap between the rich and poor, and climate change. Following the ceremony, graduate Anne Donovan, 21, said she hoped the custodial staff felt represented during the ceremony. “It was very noble, and very Tufts,” said Donovan of Brewster, N.Y., who graduated with a double major in international relations and Chinese. Scarlett Hao, 22, who was graduating with the same two majors, said she looked forward to a trip to Asia before starting a job as a business analyst. “I’m very relieved to have a concrete path,” Hao said. Nicholas James Macaluso, 22, said that he did more than he could have imagined in college, including taking a summer-long trip to Nepal to teach in a school. “The students at Tufts are passionate in all they do,” he said. 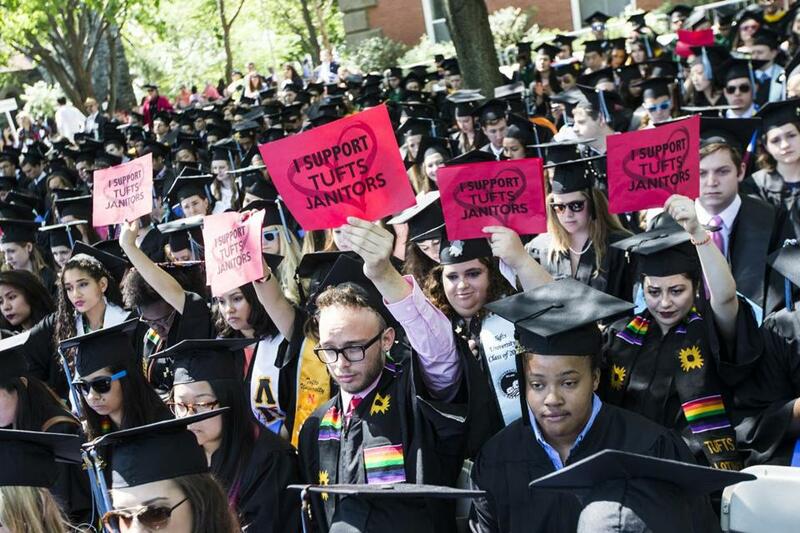 Dozens of graduates held red signs during the commencement ceremony, with the words “I support Tufts janitors” on a heart shape.